One of my favorite cookies when I was a child was no bake cookies, as my mom called them. I’ve only made them once before, but this weekend when the oven was occupied drying tomatoes and we were craving sweets, it was time for no bake cookies! I’ve updated the recipe to be gluten-free and a wee bit tastier. Mix thoroughly, then drop by spoonful onto waxed paper. Allow to harden and cool about twenty minutes. 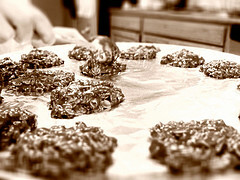 Super simple, super yummy…even my ten-year-old can make these cookies!